Thank goodness I had yesterday off work, I needed it to catch up on laundry and housework after all the Christmas festivities. And I’m thankful to have leftovers from the festivities also, it’s nice having a little break from kitchen cleaning! 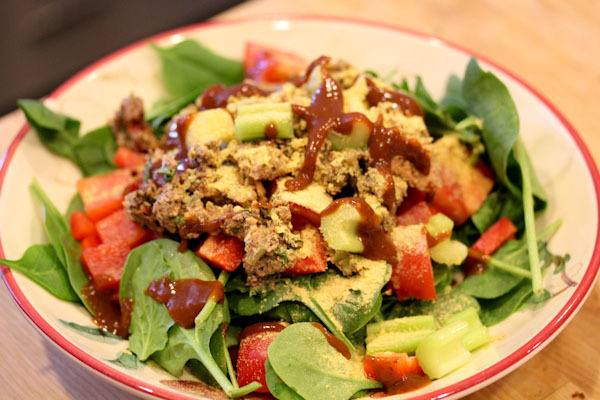 I re-mixed the raw vegan nut loaf from Christmas Eve by crumpling it on a salad topped with nutritional yeast and a drizzle of vegan steak sauce. Eerie how much it looks like meat loaf, but it tastes much better than any meat loaf I remember. I really like the solid, hearty, but lighter texture of it – it’s satisfying while not hitting my stomach like a rock. 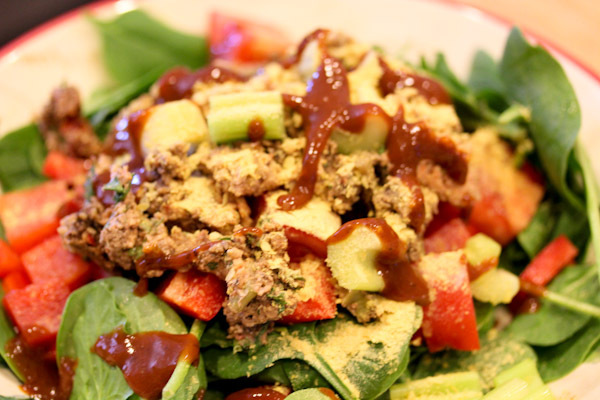 Even though the nut loaf recipe is a little complicated, it’s a great raw recipe to make ahead and freeze individual servings for fast and fresh meals. Thumbs up for Gena’s nut loaf and I will make it again. 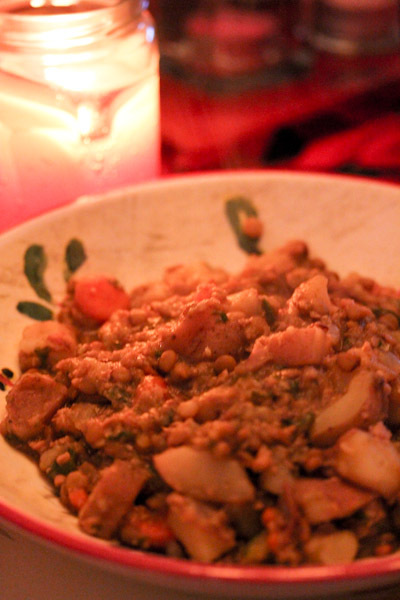 I also have a lot of ingredients left in my fridge from all the festive recipes and threw a lot of them into a simple lentil stew for dinner last night. Hearty and satisfying on a cold winter night leaving more leftovers to stash in the freezer for simple lunches and dinners. 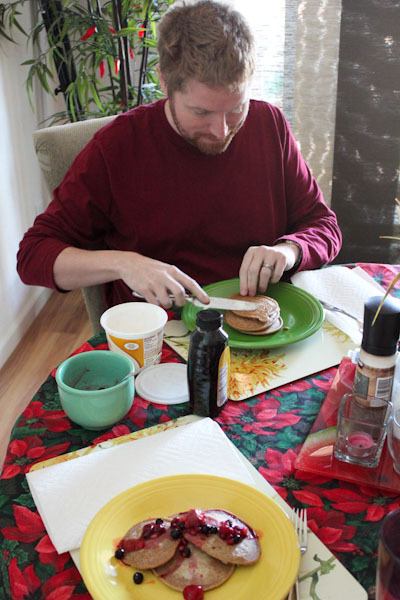 On Christmas morning, I decided I wanted pancakes. But did not recipe plan for them and missing some ingredients to just about every vegan recipe I pulled up. I ended up inventing one last minute in the Vitamix using what I had in the pantry and they were probably the best pancakes I’ve ever made with a fluffy and light texture. I like those kind of accidents! Place all ingredients except coconut oil into a high speed blender and blend to a smooth and creamy texture. Melt coconut oil over medium heat in a large skillet. 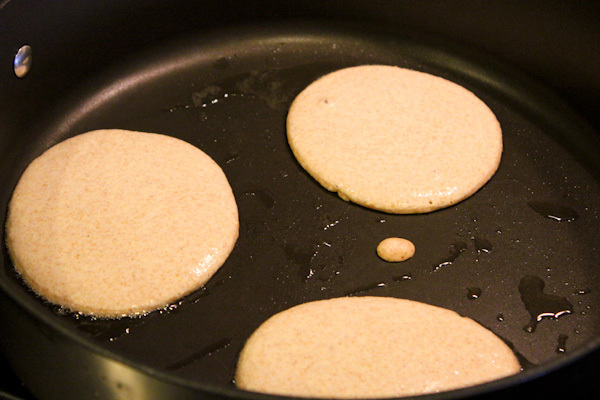 Pour pancake batter from blender into the skillet in about 3-4″ rounds. Flip with a spatula when center starts bubbling and cook for another 4 minutes or until golden on the under side. Makes 6-8 pancakes. Blending the batter in the Vitamix pumped more air into the batter causing the pancakes cook up fluffier and softer, but the texture was also firm enough to support toppings without getting soggy quick or falling apart. 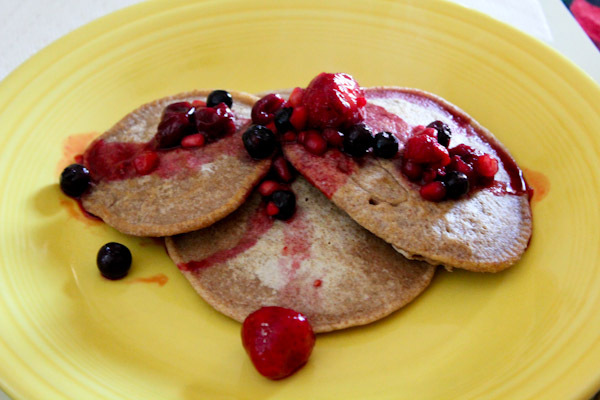 I topped them with a thawed berry mixture and drizzle of agave nectar, just perfect. And I was thrilled they were a hit with hubby who topped his with Earth Balance and agave nectar. 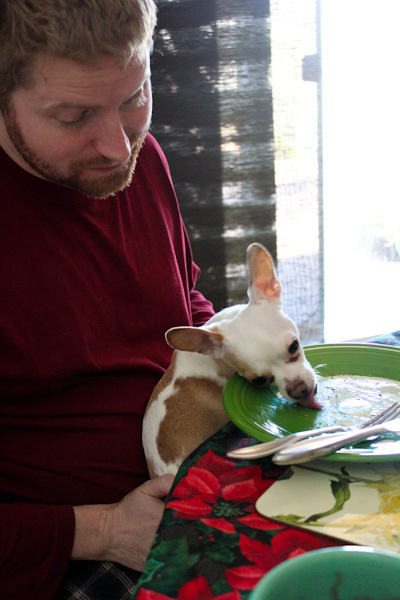 He’s more of a pancake connoisseur than me, but really like the slightly sweet and fluffy texture of these. Of course Miko approved too. Welcome home! Glad you made it safely! Cute pic at the end! Ha! I like how you tried to make them anyway even without the ingredients. I usually give up if I don’t have any kind of almond/soy/whatever milk around. I’ll have to try yours when I find myself in that situation again. The best part of the holiday dinners, or any dinner party (aside from the good company), is the leftovers to be used to make new dishes. Gives dishes multiple lives and personalities! So true on leftovers, I love having healthy and great meals ready to go. Paco LOVES leafy greens and celery bits.